(Hindi:कचनार, sanskrit: कोविदार Urdu: کچنار) is a species of flowering plant in the family Fabaceae, native to southeastern Asia, from southern China west to Pakistan and India. 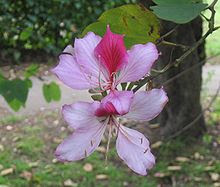 Common names include Orchid tree, Camel's Foot Tree and Mountain-ebony. It is a small to medium-sized tree growing to 10–12 m tall, deciduous in the dry season. The leaves are 10–20 cm long and broad, rounded, and bilobed at the base and apex. The flowers are conspicuous, bright pink or white, 8–12 cm diameter, with five petals. The fruit is a pod 15–30 cm long, containing several seeds. This is a very popular ornamental tree in subtropical and tropical climates, grown for its scented flowers. In the Neotropics, it can be used to attract hummingbirds - such as Sapphire-spangled Emerald (Amazilia lactea), Glittering-bellied Emerald (Chlorostilbon lucidus), or White-throated Hummingbird (Leucochloris albicollis) - into gardens and parks. On the other hand, in some areas it has become naturalised and invasive. Orchid tree flower which in India is used by poor folks as food.